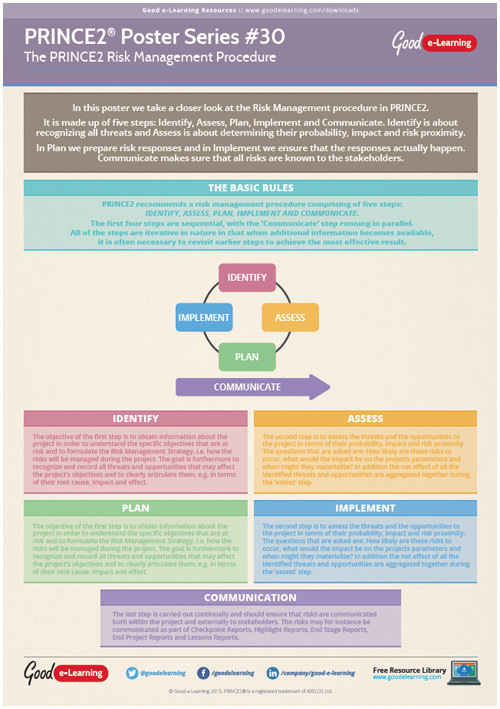 In this learning PRINCE2 poster we take a closer look at the Risk Management procedure which is made up of five steps: Identify, Assess, Plan, Implement and Communicate. Identify is about recognizing all threats and Assess is about determining their probability, impact and risk proximity. In Plan we prepare risk responses and in Implement we ensure that the responses actually happen. Communicate makes sure that all risks are known to the stakeholders. Download this PRINCE2 learning poster today and you’ll also gain instant access to our entire library of 450+ Business and IT learning resources!